When it comes to increasing your social media followers, I’m sure you have heard of using social media automation to assist with this process. In this post, I’ll cover the basics of how to use social media automation for bulk following and unfollowing of users in order to grow your social following. While this approach might not be for everyone, it has proven to be very successful for those who use it. In fact, gaining social media followers through automation is one of my favorite Twitter tips. Now here’s the part where I tell you that should you decide to use this approach, be aware of any terms and conditions you could possibly be violating for the social media channel you are doing this on. Abusing or even using this approach can result in account limitations or even termination. Ok, enough with the potential pitfalls – let’s get into why people bulk follow and unfollow on social media. When it comes to social media automation, aside from scheduling social media updates – automated following and unfollowing is a common component. Why would I want to mass automate getting more followers? Perhaps the better approach is to first ask what does this process typically entail? It’s not too bad until you get to the part about repeating it hundreds of times. I don’t know about you, but I have better things to do with my time. This is where social media automation comes in. Just about any repetitive process can be automated – and scaled. And this is true for bulk following (or unfollowing) social media accounts. In fact, most of the larger social media accounts use this type of approach – do you think people really went and manually clicked “follow” on tens of thousands accounts? I highly doubt it. Like other social media automation tasks, people who look to automate this process primarily do so in order to save time. However, don’t purchase social media followers as these are almost always fake social media followers. By bulk following and unfollowing accounts on your own you reduce the amount of fake accounts you follow. While it is not perfect by any means, it is one of the best ways to scale the growth of your social media follower accounts. Honestly, none of them – whether they say it or not. Some will have it clearly mentioned in their terms and conditions. You’ll notice they refer to this practice as “follower churn” – and don’t recommend doing this as your account could get suspended. If your account is aged and not brand-spanking new, typically you are ok. However, if you create a new account and immediately go out and follow 1,000 accounts, you will probably be suspended. With Twitter follower automation you need to be smart. 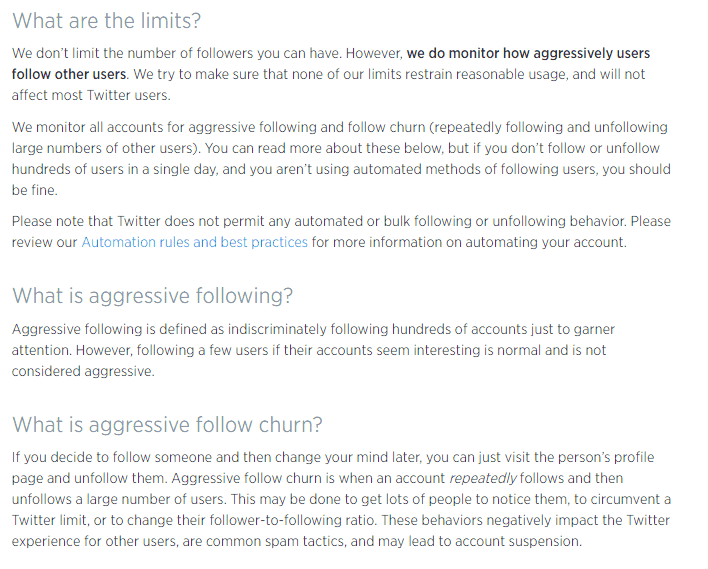 Naturally, the older the account is and the more followers you have – the rules seem to bend a little. Meaning that you can probably follow close to 1,000 accounts every 24 hours or so and not have any issues. However, you will need to be mindful of your account trying to follow more than 5,000 people. 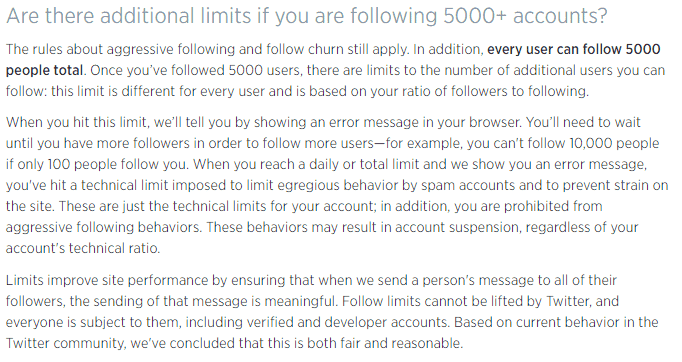 So once you are up against that 5,000 following threshold, you’ll more than likely want to bulk unfollow some of those Twitter accounts. I guess you could consider mass following and unfollowing on Instagram as artificially collecting followers. Just be reasonable in how you use it and you’ll be fine. With Pinterest, similar to Instagram – I did not see anything immediately called out in regards to automation (If you come across it, please let me know). There are a variety of social media tools that can help you automate the process of following and unfollowing users on social media. 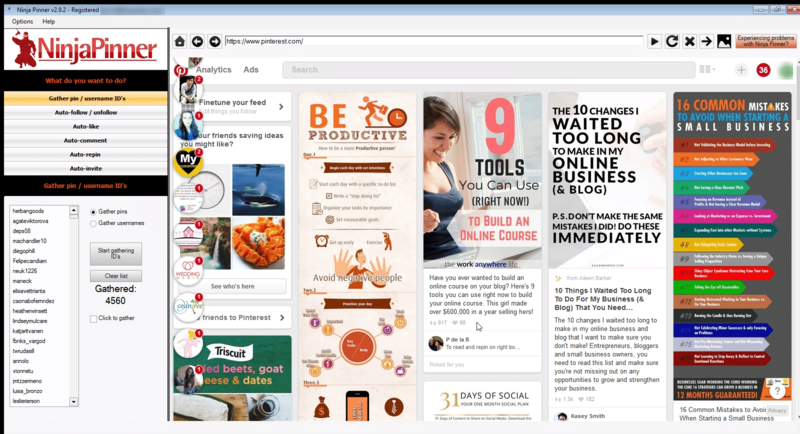 In fact there are well over 500 different social media tools. But which ones should you use for social media automation? It really depends on the channel you want to automate as I find it difficult to find a single tool that works well on all the major social media networks. Twitter probably has the most options for automated bulk following and unfollowing of users. Through the years, there have been many tools that come and go. The best thing to do is to look at what each option offers and decide what will work best for you. 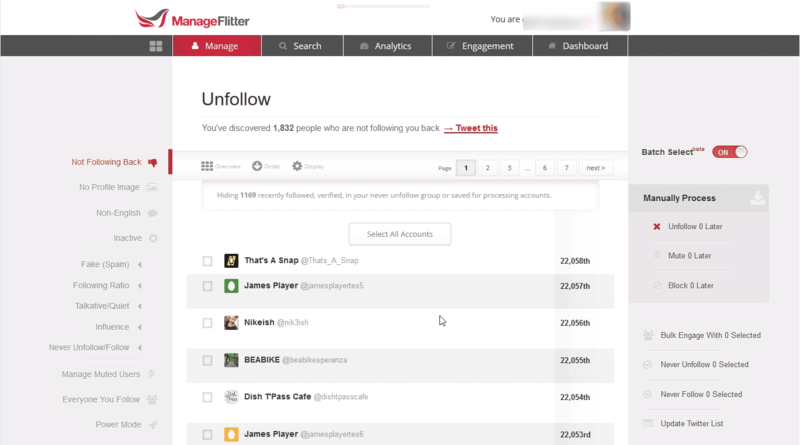 For the past few years, I have been a fan of ManageFlitter to bulk follow people on Twitter. While it is not free, it does provide me with the options I am looking for to mass follow Twitter users (or unfollow). There are more things it can do, but I find that these are the key features I tend to use again and again. And if you want to build your own tool, here’s how to build a twitter follow bot. Instagram recently made changes to their API, so that along with the site being relatively young leaves fewer options for mass following and unfollowing Instagram users. For Instagram, I have found that most of these tools work outside of their API. This is primarily due to the fact that bulk following apps won’t get approved for use of the API. If you go with an Instagram app to follow and unfollow, chances are that it won’t be a web based app like ManageFlitter. Instead, these are typically desktop applications that you install on your computer and then run them yourself. When using desktop apps, you might need to consider the use of proxy IP addresses. A proxy IP address will essentially change the default IP address of your computer when using certain Instagram accounts in a desktop application. As a result, to Instagram it will look like different computers are running these automated processes. How to mass follow on Instagram? One such program to mass follow and unfollow on Instagram is NinjaGram. NinjaGram will do many other things in addition to following and unfollowing – so it is a really well rounded tool to have in your arsenal. Oddly enough, for Pinterest mass following and unfollowing I found a tool by the makers on NinjaGram. It’s called NinjaPinner. Since it is made by the same company, many of the features are similar between the two applications. Similar to other unfollowing apps, you can mass unfollow Pinterest users who are not following you back. One nice feature with NinjaPinner is that you can tell it not to unfollow users who you followed less than “X” days ago. This helps allow new users you followed some time to follow you back before unfollowing them. Does Bulk Following and Unfollowing on Social Media Work? Speaking from experience, this approach works. For example, in just a year and a half I was able to help grow a Twitter account from 5,593 followers to over 37,829 followers. That’s a 576% increase if you are keeping score at home. Sure, number of followers can be considered a vanity metric and not be a true indication of social media success. In this case, with proper social media tracking I was able to prove that their social media efforts were paying off. Of course being engaged and active with your audience is what will truly drive your social media efforts to be successful. You’ll need to look at social media automation such as bulk following as a small piece of your social media strategy. The goal of your social media automation strategy should be to identify repeatable tasks that can be done in bulk in order to free up more time for engagement. Do you bulk follow and unfollow users on social media? Let me know why or why not in the comments below.